The volume of material published and shared by anti-fluoride, anti-vaccine, pro “alternative” health – all which fall under the deceptive catch phrase of “pro-choice” – is notably bereft of critical thinking. No doubt there will always be some attracted to the notion of oppressive governments and dark conspiracies. Research indicates the psychological predisposition to conspiracy theory is highly resilient. Yet the persistence of the claim vaccines are the cause of a host of childhood ailments, that homeopathy is effective or that fluoride is a poison added to water supplies, may in part indicate poor cognitive manipulation of available information. It is not uncommon to find preposterous claims circulating as a purported superior health choice. Such material is favoured by those who contend they are exercising “pro-choice” as a result of having “done my research”. It’s clear that no independent, accredited source has evaluated this “research”. It is more evident that the person has not sought reputable source material or thoroughly investigated critiques of the main aspects of their research. Let’s try claims by one so-called alternative. Homeopathy. A good example would be claims made by homeopath Isaac Golden. Golden claims homeoprophylaxis (homeopathic immunisations) are a safe and effective alternative to vaccination. In a very short time one can find that homeopathy has not been shown to offer any measurable effect beyond placebo. Consider the National Health and Medical Research Council statement on homeopathy [PDF]. The National Health and Medical Research Council today released a statement concluding that there is no good quality evidence to support the claim that homeopathy is effective in treating health conditions. Its release follows a thorough review of the evidence, conducted as part of NHMRC’s responsibility to provide advice and support informed health care decisions by the Australian community. The conclusion is based on the findings of a rigorous assessment of more than 1800 papers. Of these, 225 studies met the criteria to be included in NHMRC’s examination of the effectiveness of homeopathy. The review found no good quality, well-designed studies with enough participants to support the idea that homeopathy works better than a placebo, or causes health improvements equal to those of another treatment. A little more time reading evidence based material will reveal the mechanism of homeopathy to be impossible. In short it simply cannot work without rewriting aspects of physics and chemistry. Homeopaths often actually admit this – while being dishonest about observed effects. Golden himself makes much of having completed a PhD in homeoprophylaxis, leaving the uneducated listener or reader under the impression that this thoroughly discredited pseudoscience is in fact a safe option in health science. Or as opponents of vaccination insist: a Choice. Indeed Golden claims homeopathic vaccines are an option which is “comparably effective but which is non toxic, which provides no danger, no long term side effects”. In June this year “Dr. Isaac Golden’s Academy” was offering a YesCourse. The effectiveness of the program could not be established with statistical certainty given the limited sample size and the low probability of acquiring an infectious disease. However, a possible level of effectiveness of 90.3% was identified subject to specified limitations. Further research to confirm the effectiveness of the program is justified. Possible efficacy, subject to specified limitations, that requires further research is a very, very clear way of documenting no effect. I apologise but there are no prizes for guessing Golden has not gone on to search for, much less publish, the possible efficacy. This won’t prevent him waxing lyrical on “my own PhD” as a source in defence of homeoprophylaxis. In 2010, following a complaint from Dr. Ken Harvey, the TGA’s Complaints Resolution Panel ordered that a Retraction be published on site. Sheffield ignored the request. Regarding the TGA Therapeutic Goods Advertising Code, Sheffield was also noted to have acted in a misleading manner, abusing the trust and exploiting the lack of knowledge of consumers. A summary and key details can be found here at the Skeptics’ Book of Pooh-Pooh. The notion that parents who choose alternatives are not actually researching or seeking reputable advice on their apparently “informed choice” is in this case further highlighted by ongoing offending by Fran Sheffield and Homeopathy Plus! 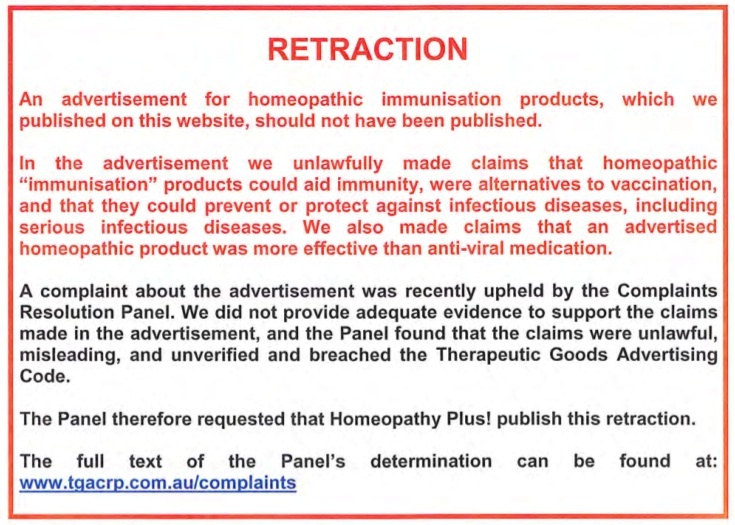 In May 2012 the ACCC announced it had responded to complaints from the medical industry about bogus claims on the Homeopathy Plus! website. Namely that the pertussis vaccine was ineffective and that Homeopathy Plus! offered an effective homeopathic immunisation for pertussis. On December 23rd, 2014, the ACCC reported that the Federal Court had found both Homeopathy Plus! and Frances Sheffield had engaged in misleading conduct and made false or misleading representations regarding the effectiveness of the whooping cough vaccine and homeopathic remedies as an alternative in breach of the Australian Consumer Law. Sheffield and Homeopathy Plus! had engaged in misleading and deceptive conduct. Put simply, Fran Sheffield had continued to use her website to lie to unfortunate visitors who were not in the habit of critically investigating such claims. I should be clear. This is only one arm of a notable junk science making as a matter of course outrageous claims. To see that so many can be fooled into believing plain water can protect from disease in a manner no-one can explain, is to some, mind boggling. But to be even clearer the information to debunk such nonsense and thus protect yourself and family is there to be found. It is plain that scam artists, conspiracy theorists and so on cannot be swayed by the findings of official investigations or years of scientific consensus. Thus it is better to ignore those who claim to hold an apparent truth or a wonderful therapy and subject their claims to robust and varied critique. Critiques can be made for all of the pseudosciences purporting to offer a superior or natural alternative to evidence based medicine. The same applies to the unwarranted attacks on vaccines, fluoride, medical intervention and so on. A far better way to approach these topics is to do so with the confidence to review material from a bipartisan standpoint. Where claims of conspiracies or corporate corruption for profit are made be very skeptical. Make a habit of visiting consumer advocacy groups, such as Choice. Spend some of that research time looking over the Therapeutic Goods Administration and the Australian Competition and Consumer Commission. We looked at both of these and the NHMRC, above. Let’s say the best your new friends at Essence Of Moonbeam are offering in response is a claimed conspiracy, the mocking of “sheeple” or bemoaning the trampling of rights (or that “informed choice”). I’d say you’re pretty safe in concluding genuine evidence has caught up with debunking their claims. No-one can develop the skills or knowledge base from the Internet to argue that “my research” on one topic is sufficient to make decisions that are traditionally overseen by specialists or experts. The skill we can develop is that by which we can discern between a reputable source and a disreputable source. And this process should include discussions with genuine, experienced practitioners. There is too much information on individual areas of health to allow us to investigate fully and believe we may come away educated and/or able to advise others. Where new trends are jostling for our attention and money there are recurring themes that help reveal them to be useless. The skills we develop in discerning the reputable from bogus information sources are increasingly the skills that will benefit us in more ways than seeking optimal health. What is willfully ignored is, *things that work* vs things idiotic. I suggest that the ancient Athenians had the right of it. Donald Trump being a prime example.